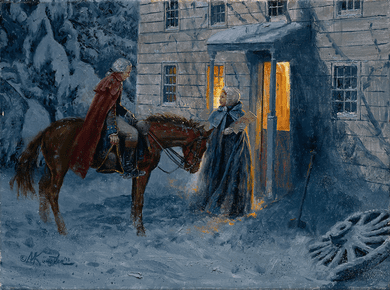 Mort Kunstler Handsigned and Numbered Limited Edition Giclee on Canvas:"Sally's Valentine"
About the Art: Long Island brimmed over with information - and danger - for spies and patriot sympathizers. British and Loyalist troops prowled there regularly, suppressing patriots and fighting off whaleboat raiders from Connecticut. In the winter of 1778-79, a loyalist unit called the Queen's Rangers under Lieutenant Colonel John Graves Simcoe camped in Oyster Bay. Simcoe took up quarters in Samuel Townsend's house, the Homestead. 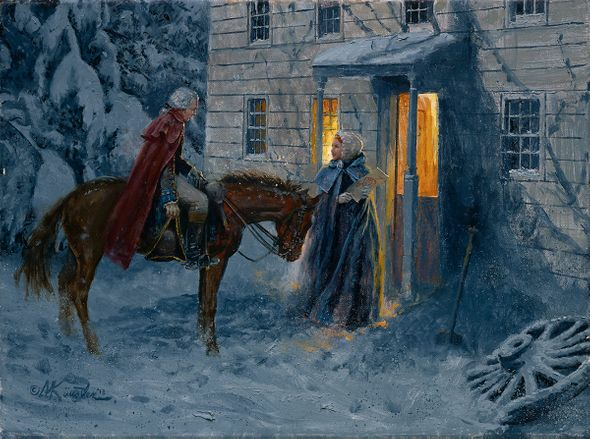 The accommodations provided an additional attraction in the form of Townsend's nineteen-year-old daughter Sarah or "Sally." Many officers courted her, but of course the tall and handsome Simcoe stood foremost. He fell hard for the young damsel. Some time that winter, it is said, Simcoe penned a valentine to Sally, adding to it a pair of hearts with their initials pierced by an arrow, along with a poem. "Fairest Maid where all are fair," it began, "Beauty's pride and Nature's care; To you my heart I must resign; O choose me for your Valentine!" Whether disgusted by such doggerel or (as legend states) irritated at Simcoe's decision to cut down her father's apple orchard, Sally spurned her suitor and sent him packing. As an avowed patriot, she might well also have passed on intelligence of the Queen's Rangers to any of the American spies who were plentiful in the area. It is believed that she remembered the incident so fondly, however, that she kept Simcoe's valentine until the end of her life in 1842.